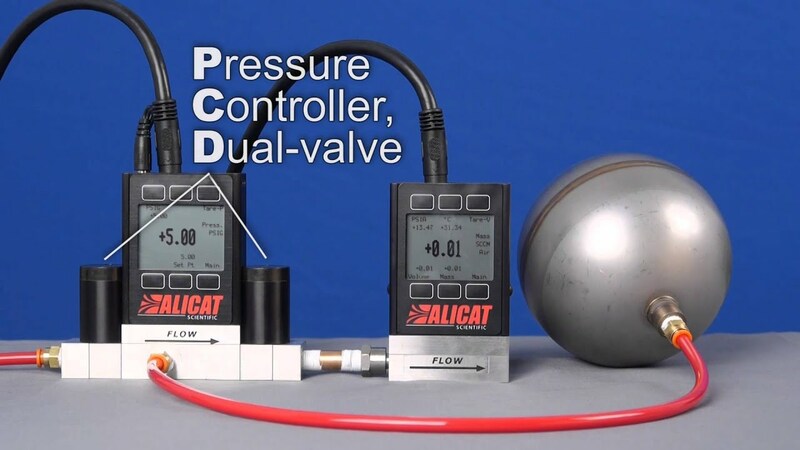 Differential pressure instruments from Alicat have sensors that measure the difference in pressure between any two points in your process. If you leave the downstream port open to atmosphere, the differential pressure readings become equivalent to gauge pressure readings, allowing differential pressure instruments to work as gauge pressure instruments as well. P-series differential pressure transducers display the pressure difference between your two measurement points. The PB-series differential pressure transducers add a rechargeable battery to make pressure audits easy. PC-series differential pressure controllers use a single valve to maintain a constant pressure differential between their two measurement ports. Their flow paths are isolated from the two ports of the differential pressure sensor. Each of these two pressure measurement ports can be plumbed to any point in your process. PCD-series differential pressure controllers use two valves to control pressure differentials for closed volumes. The second valve opens only to vent excess pressure from the system. Like the PC series above, each of the two pressure measurement ports of the PCD for differential pressure is isolated from the flow path and can be plumbed anywhere in your system. Characterize a filter’s flow versus pressure drop curve by fixing the differential pressure across the filter. Cycle through several pressure differentials that are all referenced to the simulated Martian atmosphere instead of Earth’s own atmospheric pressure. Measure the differential pressure between any two points in your process. The two process ports connect to opposite sides of the differential pressure sensor; positive readings denote higher pressure at the left (upstream) process port, and negative readings denote higher pressure at the right (downstream) port. This differential pressure transducer can also double as a dead-ended gauge pressure transducer if you leave the downstream port open to atmosphere.